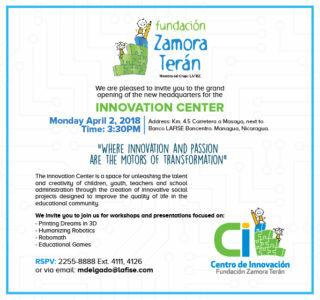 On April 2, 2018, Fundacion Zamora Teran (FZT), a non-profit organization focused on implementing the One Laptop Per Child educational program in Nicaragua and throughout Central America, celebrated the grand opening of its Innovation Center in Managua. The FZT Innovation is a space where students, teachers and the community can create innovative projects designed to improve the quality of life in the community. Visitors have an opportunity to build and create using 3D printers and robotics. Participants learn programming and coding skills as they work on projects to address local concerns. OLPC applauds FZT’s work to provide all students in Central America and beyond with a quality, 21st Century education. To learn more about FZT’s OLPC educational program, visit http://fundacionzt.org/en/.